Four people were killed in the southern port city of Aden by gunfire as police moved to disperse protesters, medical officials and witnesses said. In the city of Taiz, one person was killed and many injured when a grenade was thrown from a car at protesters. 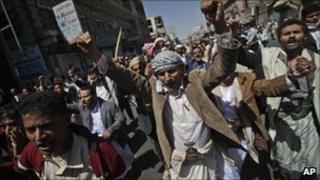 And in the capital Sanaa, supporters and opponents of President Ali Abdullah Saleh clashed on the streets. During what has been described as a nationwide "Friday of rage", tens of thousands of protesters in several cities demanded that Mr Saleh leave office immediately. "Ali, listen, the people want you out," they chanted. They are angry about corruption and unemployment in the country. In Aden, police fired rubber bullets and tear gas to try to break up thousands of anti-government demonstrators. Some protesters said live rounds were fired. Four people were killed, medical officials and witnesses said. Four government cars and a local government building in the Sheik Othman neighbourhood were torched and clashes continued after dark, the Associated Press news agency said. In Taiz, a grenade thrown from a speeding car into a crowd of demonstrators killed one person and injured more than 20. More people were injured in the stampede that followed the explosion. Officials in Taiz said a suspect in the grenade attack was being questioned after the car involved was traced. In Sanaa, tens of thousands of protesters were marching through the city chanting anti-government slogans when they were met by riot police and supporters of the president. In the ensuing clash, the police fired shots in the air and launched tear gas canisters and the supporters and opponents of President Saleh threw stones at each other. Four people were reported to have been injured. It was the eighth day of anti-government demonstrations in Yemen, which have been inspired by uprisings in Egypt and Tunisia, where the presidents have been forced to step down. On Thursday, dozens of people were reportedly injured in clashes between pro- and anti-government activists. The US embassy in Sanaa said on Friday it had seen "a disturbing rise in the number and violence of attacks against Yemeni citizens" at protests. An embassy statement said the attacks were "contrary to the commitments that President Saleh has made to protect the right of Yemeni citizens to gather peacefully to express their views". The embassy urged Yemen's government "to prevent any further attacks on peaceful demonstrations and to ensure that all Yemenis, both pro and anti-government, have equal rights to speech and assembly". President Saleh, who has been in power for 32 years, offered some concessions after the opposition coalition started organising protests last month. He has agreed not to run for re-election and not to hand over power to his son. But while the opposition coalition has agreed to hold talks, the concessions did not appease everyone and the latest demonstrations have been driven by a younger group, many of whom are students.